Well, I made it through my first day of work. I completely forgot how exhausting it is to wear a bra for that long. I thought I’d share my full day of eats from my first full day on the job. It was all good stuff too, as I’d spent a good chunk of time in the kitchen yesterday making sure everything was prepped for the entire week. 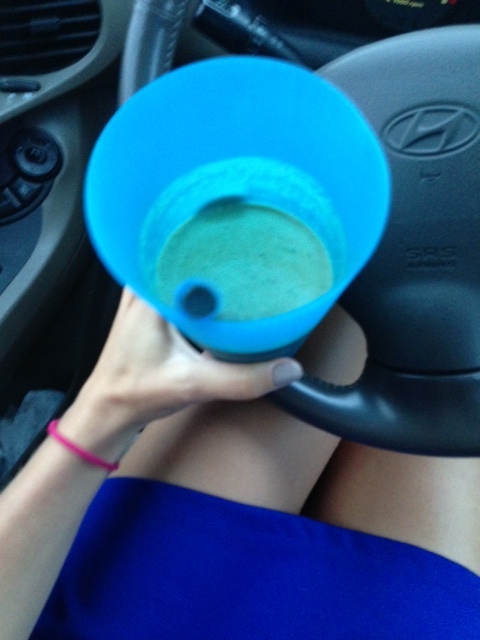 Just before heading out the door, I blended a green smoothie to slurp on the road. It consisted of spinach, frozen tropical fruit, chocolate protein powder and unsweetened almond milk. 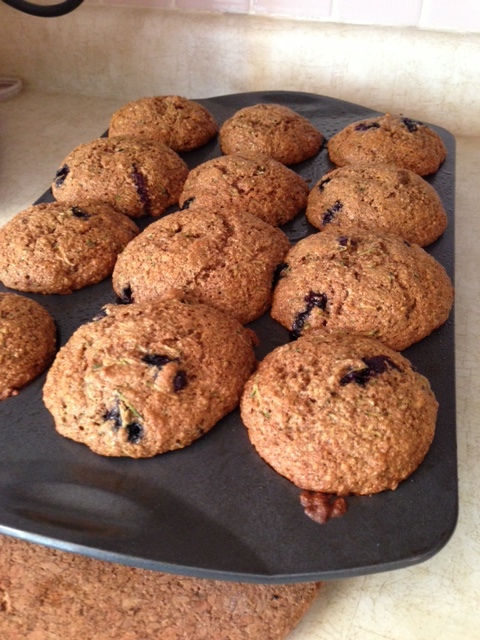 Late morning snack: whole wheat zucchini blueberry muffins (I had two). Let me know if you think I should post the recipe. Ok, twist my arm, I will. THEY ARE TOO GOOD TO KEEP TO MYSELF!!!!! Look for the recipe soon. 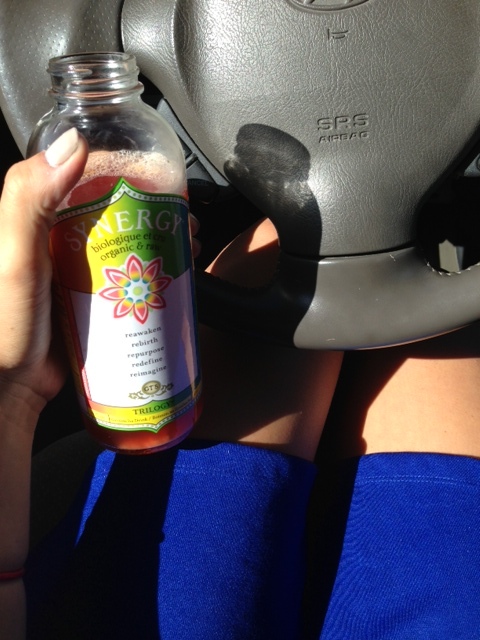 Road Soda: 1/2 of my favorite flavor of kombucha! So there ya have it. 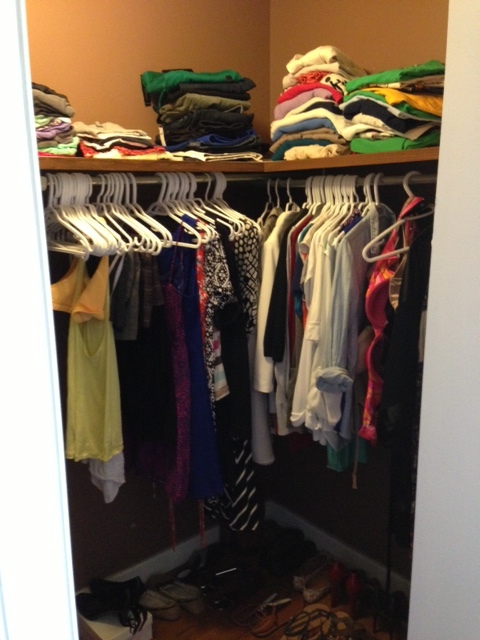 In other news, I completely cleaned out my closet yesterday. Fortunately for you, I didn’t take a ‘before’ shot, but I managed to take about 60% of what I own OUT of there. That’s the ‘after’. I feel so zen now that I can actually see what I have in there. 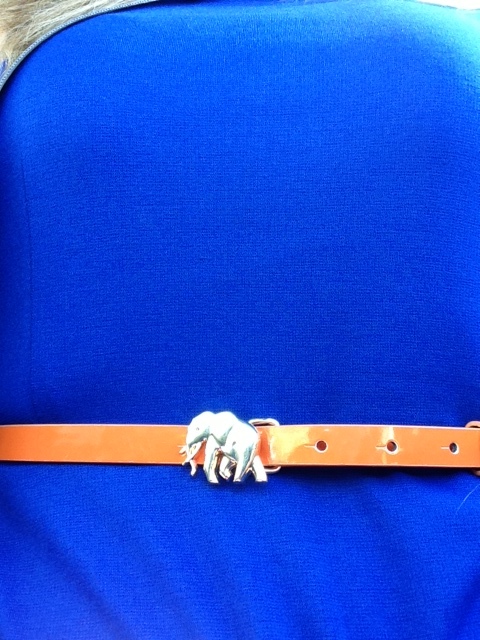 Now if only I could find someone willing to buy the rest of my clothes off me…. But he got a little tight after a day full of quinoa and 4 liters of water. Rude. Got any to add to the list? 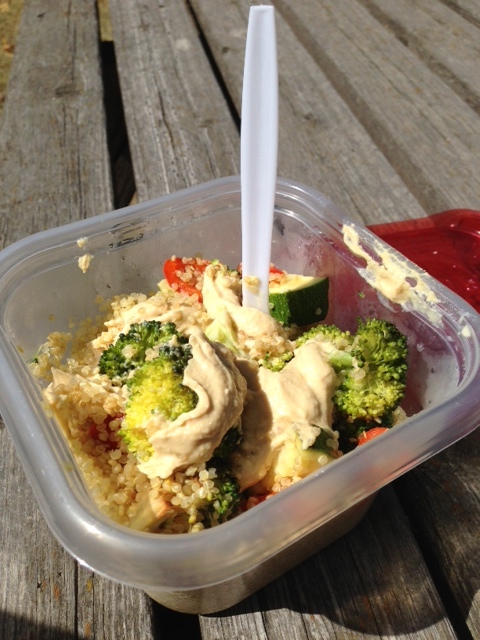 What’s your go-to packed lunch? Snacks you keep at your desk? HAHA I call kombuchas road pops too. It’s weird that Canada calls it pop. 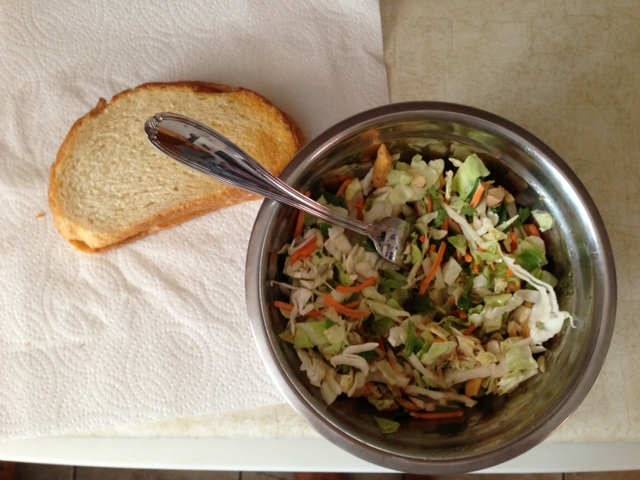 I usually pack a salad with leftovers from the night before (chicken, salmon), and for snacks – nuts, sliced fruit, cheese, a Simply bar, raw veggies. Easy finger foods! Still need to try a simply bar. Heard good things but I’m not really a bar person. Wearing a bra all day & paying attention (or faking paying attention at least) are super-exhausting! I have a fear that I’ll go back to work after being gone & there will be all kinds of bugs at my desk…I keep A LOT of snacks there. Congrats on Day 1 of the Big Girl Job! I need to massively clean this office before storing ANY food. It’s nasssssty! Oh please keep sharing your meals & snacks!! I am lacking inspiration and everything you post looks so yummy. I’m definitely making the blueberry muffins as our crop of zucchini is almost ready. I also died at the bra comment. I’m one of those odd people like prefers to wear a bra from the time I get up to when I go to bed. I love organizing my closet & drawers. I can’t stand chaos. For snacks- apple with peanut butter or a slice of cheese, trail mix, fruit, veggies, granola bar. I’m looking for more ideas though since I’m quite bored of the usual. Congrats on surviving the first day of work! Ill have to post some snack ideas. I completely forgot how exhausting it is to wear a bra for that long. <—– Snort. Sometimes I don't even wear a bra to work. Is that bad! ?